Premise- Six contestants are randomly selected from the studio audience to play the game by singing a part of a song correctly. In the first round (“Pick Four”), a portion of a song will be performed and the contestants will have to sing the next line of the song correctly. According to host Melissa Peterman, “they don’t have to sing it well; they just have to sing it right”. The first four contestants to sing a portion of their song correctly will advance to the second round. In the second round, the four contestants will play a series of three mini-musical games for points. The two players with the highest scores will advance to the third round, Chorus Showdown. In the Chorus Showdown, the remaining two contestants must sing the chorus line of a song perfectly. The first contestant to do this will win the game, the Singing Bee trophy, and a chance to play in the Final Countdown bonus round. In the Final Countdown, the band will play up to seven songs and the contestant must sing the right lyrics to the songs in order to win. For each song a contestant sings correctly, they will win $500. If they sing five songs correctly, they will win $10,000. However, if they sing three songs incorrectly, the game will end and the contestant will win the money they earned up to that point. 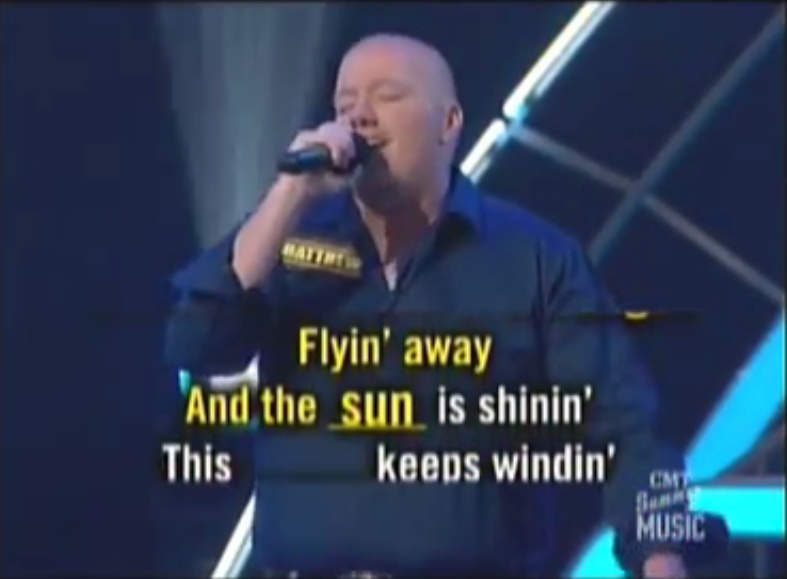 Before I begin my review, allow me to shed some light on the CMT version of The Singing Bee. The Singing Bee first premiered on NBC with host Joey Fatone in 2007. The NBC version was played similar to the CMT version with the exception of the $50,000 grand prize. Click here to check out an episode of the NBC version. Even though this version’s premiere episode debuted with over 13 million viewers, making it the biggest summer premiere since Dancing With The Stars, this show was cancelled after one season. Two years later, CMT revived the series with host Melissa Peterman. The CMT version will soon be airing its fourth season later this year. The first time I saw this show on NBC, I immediately I loved it. The Singing Bee is an awesome spin to the classic game show Name That Tune. This is a fun, exciting, and active game show to watch and equally fun to play at home as well as in the studio. I love of the variety of mini musical challenges they have in the second round to avoid stagnation in the show’s format. This is the type of game show that could easily be ruined with a host who doesn’t exhibit a lot of energy and CMT did an excellent job of casting Melissa Peterman as the host of the show. She has the humor, energy, quick wit, and (dare I say) spunkiness to keep any viewer entertained throughout the whole show. I also like how she strives to make the contestants feel as comfortable and relaxed as possible. The contestants look like they are having a lot of fun on the show and it shows through Peterman’s hospitality. The only problem that I have with the CMT version of The Singing Bee is the show’s limited song playlist in terms of genre. Given that this show is aired on a country music station, I think the show will be more appealing and attract more viewers if they played more than country songs on the shows, like NBC has done on their version. Overall, CMT did a great job of reviving The Singing Bee. Melissa Peterman is doing an excellent job of hosting the show. Even though the show primarily plays country music, The Singing Bee is still a fun show to watch. Click here to check out Season 3 episodes ofThe Singing Bee and stay tuned for the fourth season coming soon on CMT! Next Post Happy Birthday To The Whammy! : Highlights of "Whammy! The All New Press Your Luck"